Lucy drives Viv crazy trying to identify a mystery sound in a radio station contest. She determines it's a refrigerator shutting down (after destroying theirs). Lucy wins the contest, and becomes disc jockey for a day at the local radio station. It does not take long before the station is in a shambles. She entertains the masses with ten second songs, commercials played at slow speed, and bizarre sound effects. The radio station may not survive her debut in broadcasting. Special Notes: This is the last aired episode for the current format. Vivian has decided to leave the show unless she gets more creative control. Lucille's advisors tell her Vivian wants a partnership, which wasn't the fact. It is decided not to meet Vivian's demands, and Vance leaves the series. Lucille felt hurt and betrayed by her friend. This is a decision Lucille will regret for the rest of her life. Without Vivian aboard, Lucille truly toys with the idea of ending the program. Vivian only wanted to make the show better and return it to the former quality as well as have the stories revolve more around her if she was going to keep commuting to the set from Connecticut. She was exhausted and her marriage to John Dodds was deteriorating because he was bisexual and seeing other men when she wasn't around. Vivian also felt that Lucille let her down. 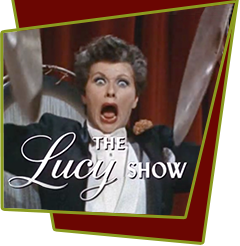 This episode was not intended to be the season finale, "Lucy the Stockholder" was. It was shot in late September 1964 and was supposed to air in the middle of the season. It kept getting pre-empted so it ended up being the Season 3 finale. The closing scene for this episode (Lucy crying amid the radio station destruction) was featured as part of the opening credit sequence beginning in Season 4.